Marshall Headphones, together with Marshall Amplification, recently announced that Hanwell is now on sale at AC Gears, J&R, Fred Segel, Urban Outfitters online and other retailers across the United States for $800. The Marshall Hanwell is also available in Europe, Japan, and online at marshallheadphones.com. 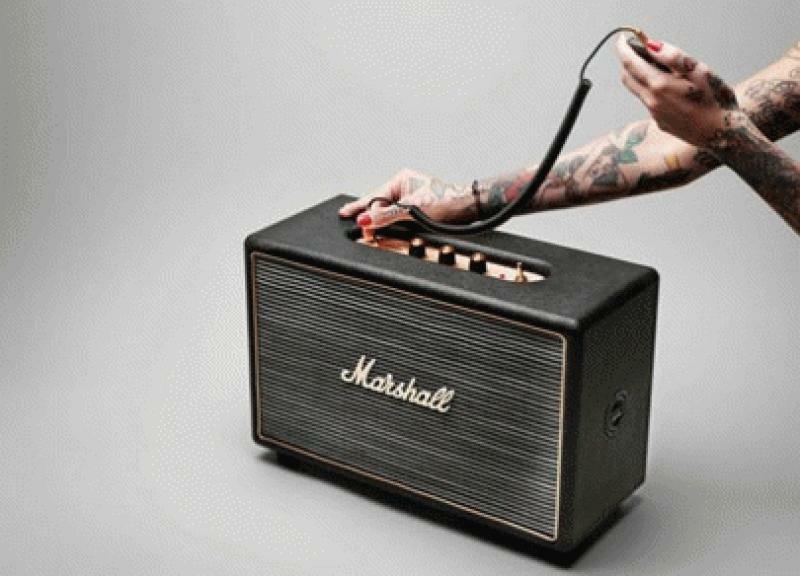 The Hanwell is the very first home audio product to bear Marshall's script logo. Hailing from a line of 50th anniversary products, the Hanwell brings Marshall's heritage into your home. The Hanwell is a carefully crafted machine, designed to attain that trademark Marshall tone. Reportedly, its dual long-throw woofers produce super lows, and hi-fi tweeters yield sharp extended highs. The Hanwell is housed in a wooden cabinet and clad in black vinyl. It features an analog power switch and controls for volume, bass and treble. The fret cloth and gold logo on the front are borrowed from vintage Marshall amplifiers. The body is outlined with gold piping for a celebratory effect. As a tribute to Marshall's 50-year legacy, each Hanwell is branded with a numbered anniversary edition commemorative badge.